It Can Happen to You is a 1956 production by the Jamaica Film Unit on the dangers of 'careless sexual behaviour and its consequences, specifically syphillis'. Lord Power and his band provide mento for the opening credits, and are seen playing "Linstead Market" outside of a post office at 5:40. The film will also be of interest to ska/Don Drummond fans, as it has a rare film appearance by his ill fated girlfriend, the dancer Anita 'Margarita' Mahfood. Here is a clip of a folk/mento/Pocomania rendition of "Linstead Market" and "Sweetie Charlie". The singers and dancers are backed by acoustic guitar and a three piece drum section. It comes from an American movie originally called "Pocomania" and later re-titled "The Devil's Daughter", a name it shares with several other movies. 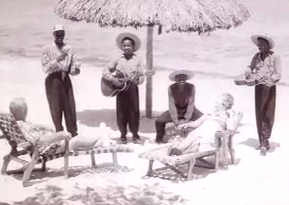 From 1939, its the earliest video of Jamaican music I've encountered. This scene opens the film. Colby Graham has IDed the location as Hope Botanical Gardens. 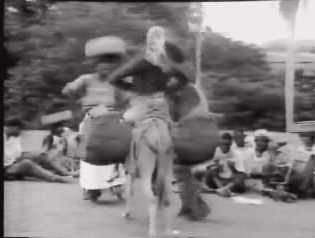 Later in the movie, there is a Pocomania performance, somewhat bastardized, as its been repurposed into a scene of voodoo in service of the film's plot. Anyone curious to see it can purchase the film from Amazon very inexpensively. of Minas Gerais - UFMG), Brazil, who brought this to my attention. He is the editor of a reggae Brazilian webzine called Massive Reggae. Leah's research has identified some of performers. Randolph Williams is joined by Nina Mae McKinney and Ida James. IT also shows that the picture was a produced and directed by Arthur Leonard from an original story by George Terwilllger and was to be called Pocomania. Courtesy of Peter Gittins of Reggae Films UK (www.reggaefilms.co.uk) here is a nice clip. The other is Dennis Syndrey. It's followed by a clip from 2002 of Lord Tanamo getting back to his mento roots at the Legends of Ska concert (featuring said Dennis Syndrey). See here for more on this historic show. late 1970 (?) performing "Big Bamboo". Discussions about the 1970s popular Canadian singer Anne Murray do not typically veer towards mento or Jamaican folk music. So imagine Dan Neely's surprise when browsing a budget bin of DVDs, his eye was caught by one called, "Anne Murray in Jamaica" and discovered that it included performance footage of "Come to Jamaica" by the mento band The Joy Makers and a complete performance of "Solas Market" by The Jamaica Folk Singers. These can be seen from the links below. The Joy Makers are not seen until the end of the clip. 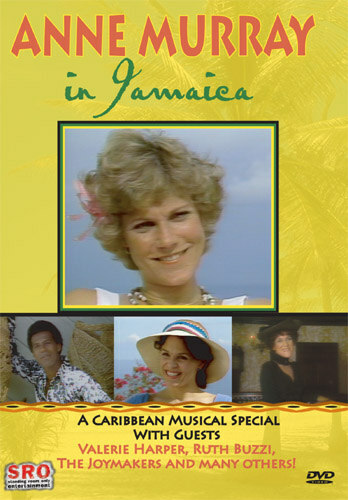 This DVD of a 1978 television special includes other Jamaican music content. 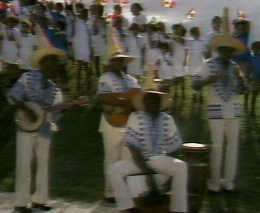 The Jamaica Folk Singers cover the Anne Murray song "Snowbird". 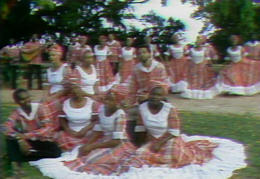 The Jamaican National Dance Theatre Company performing "The Cumina". Jamaican calypso singer Lord Laro duets with Anne on "On and On" and performing a solo calypso called "Imagine". And a middle-of-the-road calypso medley of "Mama Look A Boo Boo", "Man Smart, Woman Smarter" and another song, is sung by Anne, Lord Laro, Valerie Harper and Ruth Buzzi. The program concludes with Anne singing "Jamaica Farewell". Here's a very nice performance, dating perhaps from the 1960s, by a fiddle-based mento group. Although the band is unknown (as is the origin of this clip) the band-leader fiddler is recognizable as Theodore Miller. Check out the hand he gets for some fancy bow work. The video quality is not great, but the sound is clear. 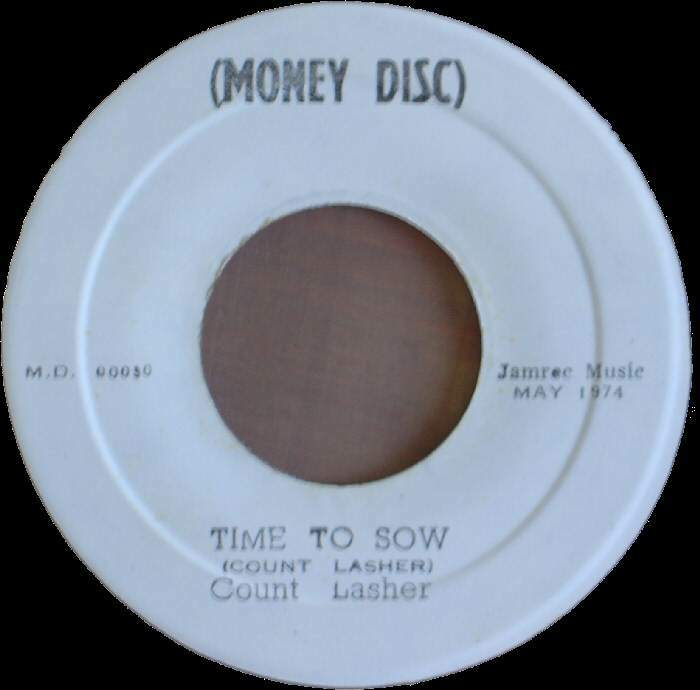 The performance is of the old folk/mento standard, "Nobody's Business", perhaps best known today from the Wailers' version with Peter Tosh on lead vocals. 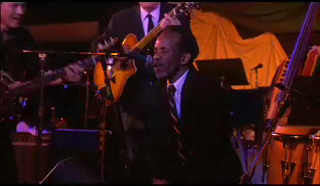 Theodore Miller can also be seen performing in the T. Miller Band in the video described below, and on the 1993 CD "Dance Music and Working Songs From Jamaica" by The Lititz Mento Band. Theodore Miller and band can be seen performing again a decade or two later at the conclusion of an 8.5 minute clip. This fine performance is preceded by interviews (primarily with Louise Bennett) and other musical performances. The Jolly Boys performs in this video clip courtesy of The BBC from 2003. Though only 46 seconds long and blurry, the clip still doesn't fail to delight. 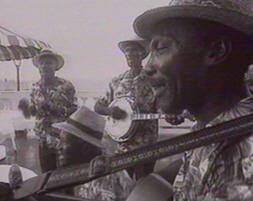 Lord Flea performs two songs, dances and even speaks a line in this 7.5 minute collection of clips from the 1957 movie, "Bob Girl Goes Calypso". Sugar Belly explains the construction of his bamboo sax and gives a brief performance in this minute long clip. Here is a nice 1970s (?) clip of The Pepper Mento Band performing a trio of songs. "More Resurgence CD Scans page" here. The trailer for the soon to be released "Reggae in the Ruff" opens with a solo rendition of "Island In The Sun" performed on rumba box and voice. for alerting me to this. This Clip is also posted on The Jolly Boys page. Also courtesy of Valerio, The Jolly Boys from the same show performing a song whose title is unknown. The Knights of The Round Table performing "Water The Garden" at Culture Heat Wave 2005 in Oracabesa, Jamaica. 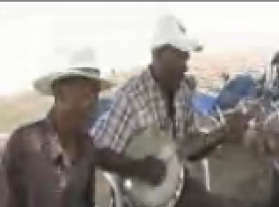 A digital-camera-brief clip of a melodic mento band performing "Hol' 'Im Joe" on the beach in Negril. David Badagnani of Kent, Ohio has identified this groups as the Sunshine Band. The Jamaican Beat Box Boys performing a medley including "Stir It Up" and "Day-O", complete with audience participation at Sandals in MoBay. Same band and place and getting laughs performing "Big Bamboo". The Theodore Miller portion of the longer clip that can be downloaded above. The Lord Flea clip that can be downloaded above. The Sugar Belly clip that can be downloaded above.